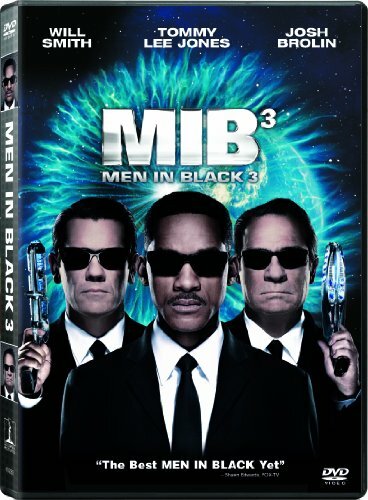 The Men in Black are faced with the end of the world as we know it, as hostile aliens fill the skies. But the solution is in the past. Starring Will Smith and Tommy Lee Jones. It's very rare that the third in a movie series is the best one of all. In fact, I'm struggling to think of a single instance where it happened before. 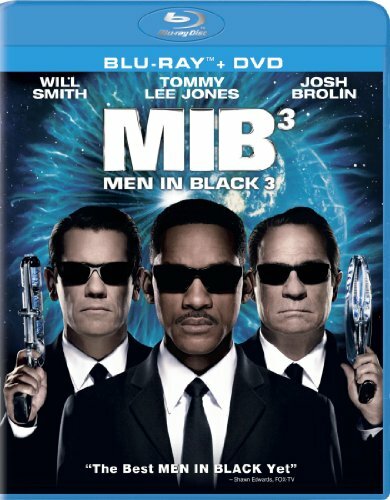 'Men in Black III' manages it. If you loved the first two, then you are going to absolutely adore this one. The format itself seems unlikely ever to get old, but the plot has a whole new twist and definitely more dimensions. I reached the end and wanted to watch it all over again! The DVD release date is November 30, 2012, making this block-buster movie a popular DVD gift for Christmas 2012. Let's face it, we were all a little disappointed with 'Men in Black II'. I'm not down-hearted with the series anymore! I loved the original Men in Black. It is, and remains, a classic movie. Men in Black II burst the bubble for me. It felt a little tired, rehashing the same ideas. 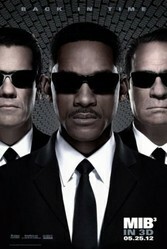 But Men in Black III turned out to be the best of the series so far! At first, I thought we were back in the same old groove. Boris the Animal is a psychopathic alien, who escapes from prison. It's up to Agents J and K to deal with him. It felt a little like every other Men in Black plot. But then everything turned on its head. For a start, the series found its heart. In amongst the brilliant special effects and fantastic comedy one-liners, there were moments of real poignancy. These included one scene, close to the end, which elicited a gasp and a resounding 'awww' from me. Best of all, there's time travel. I love time travel! Men in Black is great at exploring space, at least insofar as the denizens thereof visit our planet, but this is the first time that it's looked at time as well. The upshot is a much deeper, richer movie; never so profound as to lose its younger audience, but with implications which will have you considering aspects long after the theater lights are up. It's great family fun, which acts as a stand-alone movie too. You don't have to have seen either of those which went before to enjoy this film. I recommend it to all as a wonderful stocking-filler this Christmas. The movie is available in Blu-Ray 3D, Blu-Ray and plain, old DVD formats - or all three at the same time for the true collectors! What is the Men in Black Series All About? Here's the summary for those living under a space rock for the past fifteen years (and for those not born back then). Agent J (Will Smith) was recruited into the fabled Men in Black secret government agency. His partner is the surly Agent K (Tommy Lee Jones), who hasn't been known to crack a smile throughout all three movies. This takes a tremendous lack of a sense of humor, given how hilarious Agent J's wisecracks can be. 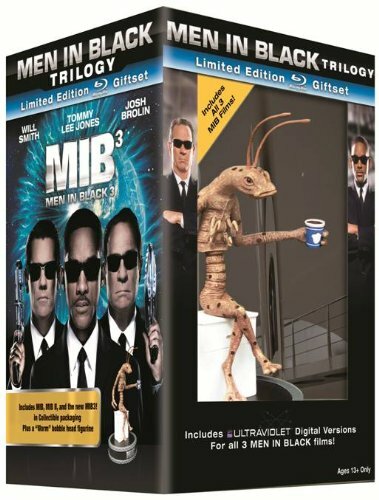 A stand-out one-liner from Men in Black III is Agent J's accusation, "That is NOT the lie you told me when you recruited me!" Ok, I guess it was funnier in context. Wearing smart black suits and sunglasses, the agents also have to ensure that Earth's human population remains none the wiser about aliens in their midst. Using a special ray-gun, Agent J erases memories of some undeniably otherworldly sightings. Usually he does it with a few words of wisdom and nice, friendly homilies. Just so that they have something sweet to muse upon, even if they have no idea why. But most of all its about the aliens; the special effects and the aliens. 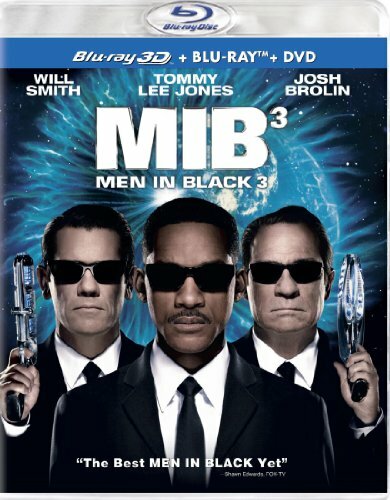 Men in Black was a series that was meant to be in 3D; and that is the best way to watch it. There's time travel involved. We knew we were about to meet Agent K over forty years ago. He's going to be younger; and he might even smile. I was slightly perturbed. Would this be Tommy Lee Jones with a trowel's load of make up on? No, the young Agent K was a totally different actor. Josh Brolin must have spent HOURS studying how Tommy Lee Jones played Agent K. He was utterly believable in the role! After a scene spent staring at him, getting over the fact that we've swopped actors, I forgot that I wasn't looking at the original K. It was extremely well done. Much kudos to Josh Brolin there. Does Men in Black III Pass the Bechdel Test? No. Though I suppose that you could argue that it's MEN in black, not PEOPLE in black. The Bechdel Test requires there to be two or more named women. There were two. Agent O is the head of department, so hurray for women there. She's brilliantly played by Emma Thompson (in the present day) and Alice Eve (in the past). There was also Lily, the girlfriend of Boris the Animal. I did spot two other female characters. A screaming bar-maid and a hippy chick at Coney Island. The latter, at least, did speak. I don't recall either having names. But none of them even met, let alone had a conversation. That is the second requirement of the Bechdel Test failed. Which means that we can't even progress to the third and final part - that their conversation was about something other than men. Men in Black III only barely scraped a one out of three mark here. It could definitely have done better. I so thought of you when I saw Lady GaGa as an alien! I meant to tell you, but totally forgot! The Bechdel Test is interesting to me. I thought that as we move on, more and more films would pass it. But the opposite seems to be more true. Stories like 'Jane Eyre' (written in 1847) score highly, but others, like this one, don't. I was practically cheering in my seat the entire time I was watching this. I wasn't too keen to go see it in theaters, but my bro had promised me a gift in return for a favor, and insisted that taking me to see this movie was the gift when I told him I'd probably just watch it on DVD eventually. I'm so glad I saw it in theaters. I agree, I do think it was the best of the three. I really like that you include the Bechdel test with your movie reviews. It doesn't stop me from watching a movie, but I think it does provide interesting commentary, on Hollywood, and on society. It's freaking brilliant! I really wasn't expecting it to be that good! Geesh, now I have to go watch it. You've got me all curious!